Hallo, I am Sister Angelica. If you could hear me speak now, you would know right away that I was not born in this country. I was born after World War II in a small Bavarian village near the Czechoslovakian border. I am the oldest of 5 children and grew up on a farm. Already as a young child, I felt God was calling me to become a Religious. At the age of 17, I entered the Sisters of St. Rita, an Augustinian community. On Oct. 11 1965 I received the habit and my new name (my baptismal name is Rita) and started my two year novitiate at our Motherhouse in Wuerzburg. After my Novitiate I began a 3-year training to become a pediatric nurse. For several years after my graduation, I went into families, took care of children, helped mothers, took care of elderly people in their homes, did what is our main apostolate, Spiritual/social family care. These were good years; I truly enjoyed being with the families, helping where ever I was needed. In October 1972, I professed my Final Vows. Before coming to Racine, I worked as a nurse at a hospital in Wuerzburg. In January 1976 I came to Racine, Wisconsin. At our Senior Citizen Home, St. Monica’s, a nurse was needed. Sure, it was not easy to leave my family and country; I was a little scared also, I have to admit. However, the transition was easy, and I felt at home here fast. I love the Elderly and it is very rewarding taking care of them; I see it as a blessing for myself. 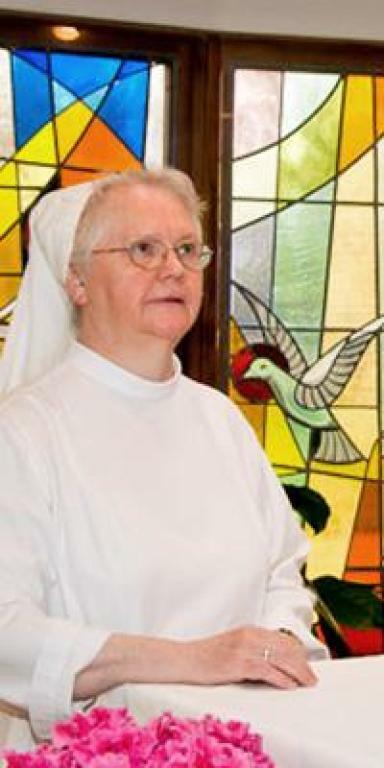 Since 1989 I also have been doing Vocation/Formation work. This too I enjoy—including the challenges that come with it. In the last several years, a special blessing for me has been to walk with many of our dying residents and help them to prepare for their death and their birth into the new, everlasting Life. I also walk with their families and help them deal with the approaching death of their loved ones and the many difficult decisions they sometimes have to make. I enjoy life to the fullest. I enjoy and treasure nature and all that has to do with nature. I do have a pet; a Quaker parrot shares my room and has become a wonderful companion. His name is Schnucki. My hobbies are: Reading, listening to music, especially classical music, singing, dancing, cooking and many more. I do treasure friendship, thanking God for some wonderful friends.